Ahly's list of injuries is still growing but they have no option but to overcome Maqassa in a tough Egyptian Premier League game on Thursday to keep alive their hopes of competing for the title. The Red Devils currently have more than 10 players on the sidelines, including some key men such winger Walid Soliman, Moroccan striker Walid Azaro and new recruit Mohamed Mahmoud, who was ruled out of the season after suffering a serious knee injury on his debut earlier this month. Ahly are stuttering in their bid to claim a fourth consecutive league crown, having won only once in their past three games. They are fourth in the table with 27 points, a massive 14 behind runaway leaders Zamalek who played two matches more. Maqassa are third on 30 points but played four matches more than Ahly. They are enjoying a fine run, thanks to an attractive brand of attacking football. 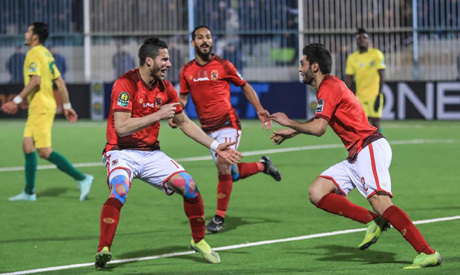 Despite their mounting injury problems, Ahly can still be optimistic after signing several high-profile players in the January transfer window, including Huddersfield winger Ramadan Sobhi, who arrived on loan, and attacking midfielder Hussein El-Shahat. Sobhi, who re-joined his boyhood club, has already started to make an impact in the few games he has played since his arrival, causing constant menace to opponents down the wing. Apart from the absences through injury, Ahly will also miss left-back Ayman Ashraf due to automatic suspension.